There just aren't that many high school football fields in Texas that can be considered exceptional. For many reasons, high school football schedules are typically played out each fall on fields most would describe as "decent", or "well, at least it's green (until Homecoming)", or "good enough for a school our size". For Sabinal ISD's Ruben Olivares, it's clear that mediocrity is not the goal. 'Good enough' simply will not do. At Sabinal ISD, distinction is the prevailing virtue, and it shows. For this reason, Texas Multi-Chem is proud to honor Ruben Olivares with the TMC Sports Turf "MVP" Award. With the complete support of the Sabinal ISD Administration, "MVP" Ruben Olivares works tirelessly to create a home field advantage for their high school football teams when they take the field at Yellowjacket Stadium each week. Ruben Olivares and Sabinal ISD are another example of the fact that great sports fields don't require large teams of groundskeepers and large budgets. It's also yet another testament to the fact that a school district doesn't have to convince it's community to install a costly synthetic turf football field, but rather enhance it's focus on making the existing facilities better than ever - a MUCH cheaper endeavor. 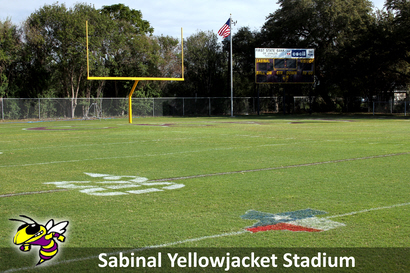 To view more images of Sabinal ISD's Yellowjacket Stadium, go here. In fact, having seen a highlight video (Yellowjacket Stadium is best seen in the Brackett Highlights video) online showing Sabinal's Yellowjacket Stadium, a shocked superintendent from a rival school in their district phoned Sabinal's administrative offices asking when they installed synthetic turf on their football field. The truth is, Ruben Olivares and Sabinal ISD committed to the goal of improving Yellowjacket Stadium primarily through education and effort...the secret ingredients to achieving results on most great sports fields. Three years ago, the football field at Yellowjacket stadium was covered in weeds and had a very weak stand of common bermuda grass. 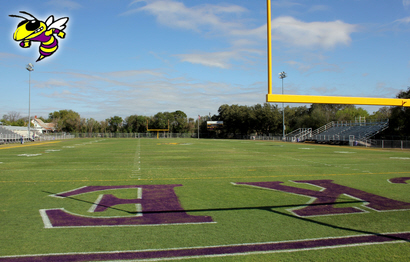 Not wanting to spend a large sum of money to renovate the field all at once, Ruben instead committed to implementing the necessary cultural practices that would result in one of the most impressive high school football fields in Central Texas - regardless of grass type (common bermuda or hybrid). The first step was to get a customized Turf Program developed by TMC that would provide the necessary year-round weed and pest control, as well as a regular fertilization routine that provides the field with the proper nutrition. The other very important change was in the mowing regimen. Ruben began religiously mowing Yellowjacket Stadium three times per week during the growing season at a height of 1 inch. Regardless of his other district responsibilities, Ruben makes sure this mowing schedule is executed properly each week. By committing to mowing more often, Sabinal needed a better solution that would help reduce the time it takes to mow the football field as well as get a better overall cut on the common bermudagrass. They retired their smaller, less effective mower and bought a Jacobsen 5-gang pull-behind reel mower. To help give their stand of sports turf on the football field an even better chance at being exceptional, TMC deep tine aerates Yellowjacket Stadium once a year. Deep tine aeration is the single most dramatic and effective cultural practice a turf manager can have done to help promote a healthier and deeper root zone. Coupled with regular top dressing following each aeration, the field's root zone is continually improved by adding USGA sand to the soil profile, giving the common bermuda grass every opportunity to grow and become stronger year after year. Walking on the field now, it's hard to imagine a much better stand of common bermuda grass on a sports field anywhere in Texas. Simply put...it's awesome. One additional and very important point to understand is that Yellowjacket Stadium currently uses an above ground, pipe-based irrigation system. The maintenance department also employs the use of a reel-based water gun to irrigate the fields as needed. This situation requires Ruben to water the entire football field by moving the pipes from position to position after each cycle. This is perhaps the best example of the MVP's dedication to results. This year's drought has caused additional strain on the maintenance pattern, limiting irrigation to twice per week, only in the early hours. In spite of these difficulties, Ruben has managed to create and maintain a truly exceptional football field...something the entire community of Sabinal can be proud of. 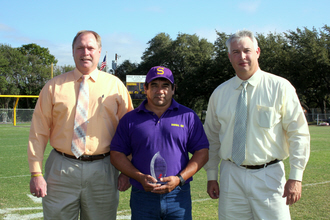 TMC congratulates and thanks Ruben and Sabinal ISD for their continued efforts at creating great sports fields. Keep up the great work!